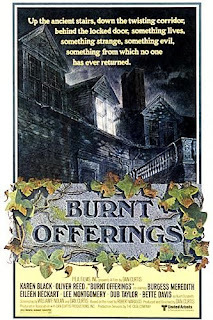 Disclaimer: I have read Robert Marasco's 1973 horror novel Burnt Offerings and have watched the 1976 Dan Curtis film that was based on it, but have done neither recently. I was just thinking of both the book and movie today and also thinking I hadn't posted anything of length here in a while, so . . .
Burnt Offerings has a pretty decent pedigree. It stars horror icons Oliver Reed and Karen Black, and features the legendary Burgess Meredith and Bette Davis in smaller, supporting roles. It was directed by Dan Curtis, from a screenplay written by Curtis and William F. Nolan. Curtis is best known for his television work, especially Dark Shadows. He and Nolan worked together on dozens of made-for-TV movies in the 1970s, including the scariest made-for-TV-movie of all time, Trilogy of Terror, which also starred Karen Black. Burnt Offerings was Curtis' only theatrically released film, and truth be told, it does sort of feel like a TV movie--but a good one! The plot centers on the Rolf family, who rent an old, run-down house in the woods for the summer, in order to get away from the hustle and bustle of city life. Davis and Meredith play the creepy old folks who own the house. Spoiler alert: things get weird. Turns out, the house is sort of a vampire, feeding off the pain and suffering of those who live in it. Burnt Offerings is suitably creepy, and the tension builds throughout the film to an appropriate climax. Reed and Black give stellar performances and Davis and Meredith knock their few scenes out of the park. However, this isn't exactly a must-see film. I might call it a minor classic of its kind. If you like pre-slasher horror like The Wicker Man, Don't be Afraid of the Dark, Night Gallery, Trilogy of Terror and The Night Stalker (also directed by Curtis), then I'd say give it a go; it's highly likely you'll enjoy it. It's available on DVD and BluRay. One last thing about the movie before I move onto the book. I read a funny anecdote, though I confess I forgot where. I mentioned William F. Nolan above. Nolan is perhaps most famous for co-authoring, with George Clayton Johnson, the novel Logan's Run, though he's had a very prolific career, spanning several genres and media. Nolan was also life-long friends with Ray Bradbury. Anyway, the story goes that Nolan was visiting the Bradbury house one day in 1976. He was talking to one of Ray's four daughters, who happened to mention she'd just seen a terrible movie called Burnt Offerings, not realizing she was talking to its screenwriter. Oops. I read the novel Burnt Offerings after seeing the film. I'd never heard of it before, nor had I heard of its author Robert Marasco. 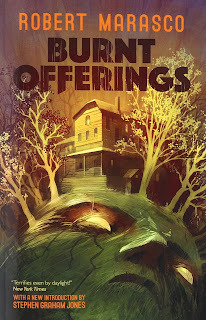 Fortunately Valancourt Books recently brought out a re-issue of Burnt Offerings, with a new introduction by horror author Stephen Graham Jones. (If you are a fan of forgotten genre novels, check out Valancourt; they've got lots of cool obscure stuff.) The novel is set in New York rather than L.A., but the premise is the same. As with most adaptations, I think the book is better. It is, however, definitely a slow burn. Not a lot of whiz-bang action and little to no blood and guts. But if you're into what the great horror anthologist Charles L. Grant called "quiet horror," then it'll satisfy. The ending is different than in the movie and is very suitably creepy. In conclusion, I wouldn't say that either the novel or movie Burnt Offerings are solid-gold classics, but both have much to recommend them to fans of old-school horror.